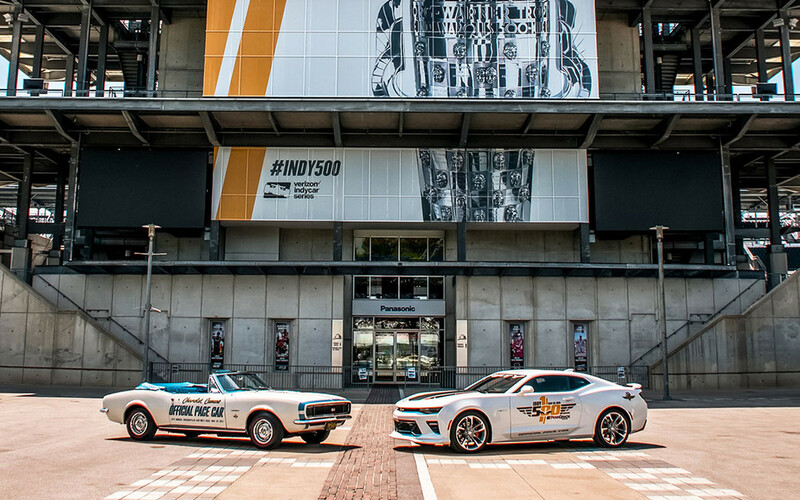 Chevrolet has been bestowed the honour of providing the official pace car for this weekend's Indianapolis 500—something it has done more than any other automaker. And with a unique version of the 2017 Camaro SS 50th Anniversary Edition leading the field, marking the 27th time since 1948 that a Chevrolet has served as the pace car, and the ninth time for the Camaro, the brand gathered all nine examples of Camaro pace cars in honour of the 100th running of the famed race. The Camaro served as the Indy pace car in its inaugural model year. A primary pace car was prepared along with an identical backup and each was powered by the 396-cubic-inch big block V8 offered in the Camaro SS. In addition to the actual pace cars, a number of identically painted Camaro models—white with blue stripes and blue interiors—were used as festival and VIP vehicles at the events leading up to the race. Distinguished by its orange-over-white paint scheme, the 1969 Camaro Indy pace car remains one of the Brickyard’s most recognizable pace cars. Like the 1967 model, primary and backup pace cars were built, each with the 396 big block. Chevrolet also produced 3,675 replicas. Marking the introduction of the third-generation Camaro, the 1982 pace car was powered by a specially-prepared all-aluminum small block V8 engine. It was driven by former Indianapolis 500 winner Jim Rathmann, who also drove the 1969 Camaro pace car 13 years earlier. Chevrolet produced 6,000 replicas. Coinciding with the launch of the fourth-generation Camaro, the 1993 Camaro Z28 pace car featured a black-and-white paint scheme highlighted by multicolored ribbons with a matching interior. The engine was the new Z28’s production LT1 engine, rated at 275 horsepower. Chevrolet produced 645 replicas, including 125 that were used as festival cars at the track. The introduction of the fifth-generation Camaro was celebrated at the 2009 Indianapolis 500 with as the fifth Camaro to pace the race. Powered by the production 6.2-litre LS3 engine rated at 426 horsepower, it required no performance modifications to lead the field. “Transformers” star Josh Duhamel drove the pace car. Chevrolet didn’t produce official replicas, but 25 similarly-styled festival cars were built. Wearing an Inferno Orange exterior with white racing stripes, the Camaro returned to the Brickyard for its only back-to-back appearance as the pace car. It was driven by 'Good Morning America' anchor Robin Roberts, who was only the second woman to drive an Indy pace car. Chevrolet produced about 200 replicas, including 50 that were used as festival cars. Camaro scored a three-peat as the pace car in 2011, this time dressed in a white-and-orange theme that paid homage to the iconic 1969 pace car. It was driven by racing legend A.J. Foyt, who was awarded the Camaro pace car when he won the 1967 Indy 500, but reportedly declined it because it didn’t have air-conditioning. Chevrolet built 500 replicas of the retro-styled 2011 Camaro SS pace car. Driven by three-time Indy 500 winner Dario Franchitti, the 2014 Z/28 pace car was the most track-focused Camaro to lead the race. It was powered by the production 7.0-litre LS7 V8, which was rated at 505 horsepower, and featured high-performance equipment such as carbon-ceramic brake rotors behind large, 19-inch forged aluminum wheels. Four identically prepared pace cars were built to support the race, all with exclusive Abalone White exteriors featuring "100th Running of the Indianapolis 500" graphics on the doors and the iconic Indianapolis Motor Speedway wing-and-wheel logo on the quarter panels. They also incorporate the exterior cues and graphics that are unique to the Camaro 50th Anniversary package that goes on sale this summer. Roger Penske will be behind the wheel of the 2017 Camaro SS pace car.